When I return from the National Pavement Expo each year, I always come away with myriad notes and ideas for future articles. 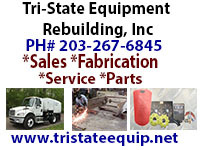 These include suggestions I pick up from contractors, info from presenters, as well as manufacturers/suppliers and more. By the end of the event, it's easy to tell that the contractors in attendance are leaving all revved up with new information and ideas, as well. When they return home – from owners of the businesses to sweeper operators – you know they go armed with information that helps them promote an increased path to professionalism in their respective organizations. That makes perfect sense: Unless they are members of the World Sweeping Association, which sends out an educational update via email to its members twice-a-month, it's the only time each year that most of the contractors have an opportunity to exchange information with each other, or to learn the best practices of their trade. Seeing the excitement and transformations first-hand, it's easy to see why those who attend are typically very clear to report that what they learned more than pays for their investment to attend. You will gain some of that 'look and feel' of being at NPE by watching our videos, looking at the photo slideshow and reading the information we provide. However, they can only provide a pale imitation of what actually went on. Plus, many contractors will tell you they picked up as much new information from talking to other sweeping contractors 'in the bar' (and elsewhere!) as from the seminars and/or show floor. If you want to truly bring your organization to the next level, I encourage you to take advantage of every educational opportunity you can, whether that's by attending NPE and similar tradeshows, by investing $325/year to become a part of the World Sweeping Association, or both. Our Editor, Ranger Kidwell-Ross, began the Award of Excellence in Power Sweeping in 1995. Since that time, the annual award has become the highest honor in the power sweeping industry. This year, the winner is a contractor who has long been involved in trying to make the industry a better, more professional place to conduct business. The award was given out at the recent 2017 National Pavement Exposition. Whether you made it to this year's NPE or not, you'll enjoy the coverage brought back by our editor. A technician at the Arizona Department of Transportation noticed that whenever their Broce Broom sweepers came in for repair, they seemed to need new front brake shoes. 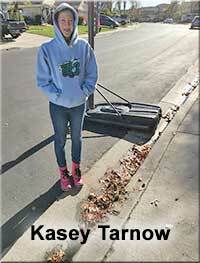 That was because, he reasoned, the broom pushed debris off toward the front of the sweeper. So, he designed the solution for the problem that turns out to work great. ADOT is now applying the 'fix' to all of its broom sweepers with drum brakes. The discussed solution should work to extend brake life for any broom sweeper you might have with drum brakes. However, primarily this is a solution for smaller, rotary-broom type sweepers. The link to sweeping tip #122, in WorldSweeper's Tip Clipboard section, includes a one-minute explanatory video provided by ADOT. That's why last fall she launched "My Street, My Ocean," a public awareness campaign targeting streets that don't have street-sweeping signs. San Clemente doesn't ticket parked vehicles blocking the sweeper on those streets. At present, warning signs and ticketing only apply to high-density neighborhoods. We encourage municipal readers to consider approaching the Girl/Boy Scout troops in their area to suggest a similar project if cars aren't already being moved prior to sweeping in their cities. Since 1965, Commercial Power Sweep, Inc. has been providing power sweeping services throughout Northern California including San Francisco, Sacramento and the greater Bay Area counties. Since that time, there have been many changes in the sweeping industry – especially in the California marketplace – and so the company's success has required adaptation to these numerous changes. Ken Lindsey has also involved his company extensively with local community service efforts. Lindsey Has traveled globally to support charities their company is passionate about, including mission trips to Africa and Turkey. Alamo Group Inc. Acquiring Old Dominion Brush Company, Inc.
Alamo Group Inc., which already owns Schwarze Industries and Nite-Hawk in the power sweeping space, is extending its reach into the manufacturing of sweeper brooms via purchase of Old Dominion Brush. ODB was founded in 1910 and is based in Richmond, Virginia with an assembly and warehouse operation in Kansas City, Kansas. The company is owned by the Brizzolara family and led by Tim and Duke Brizzolara who will continue managing the company upon completion of the transaction. ODB will become part of Alamo's North American Industrial Division. Elgin Sweeper has renewed its partnership with NASCAR GreenTM for three years and will continue to serve as the Official Sweeper of NASCAR Green. As the Official Sweeper of NASCAR Green, Elgin Sweeper and the Elgin Track Sweeper have raised the bar in terms of racetrack sweeping, drying and conditioning, mitigating dust left behind from absorbent products used to clean fuel spills on the track, and removing rubber and debris in and around the pit area. In 2016, the Elgin Track Sweeper helped with drying rain-soaked tracks and vacuuming up standing water, rubber and debris around the pit area at 76 races of the National Series and more than 200 National Series practice sessions. 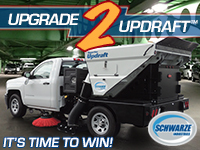 The new Schwarze Vortex adopts many of the features from the newly redesigned SuperVac Gale Force and the highly acclaimed SuperVac Updraft. The new design combines both performance and capacity at a value added price point. 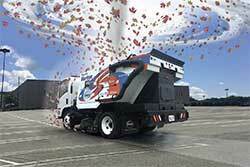 The redesigned SuperVac Vortex builds on the Schwarze portfolio of parking lot sweeper products. Its redesign follows in the path of the high performance SuperVac Gale Force and includes a variety of new and updated features. 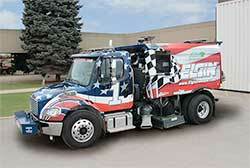 The SuperVac Vortex features the Isuzu NPR gas chassis with a highly maneuverable, 109", wheelbase. "The new enhanced SuperVac Vortex is a perfect blend of functionality and affordability and continues our commitment to the customer to innovate and advance our products" says Jim Adair, Director of Product Management at Schwarze. Thanks for reading WorldSweeper.com's February 2017 Newsletter!